National Parking Guru Donald Shoup To Come to Tacoma; Will Our Elected Officials Listen? 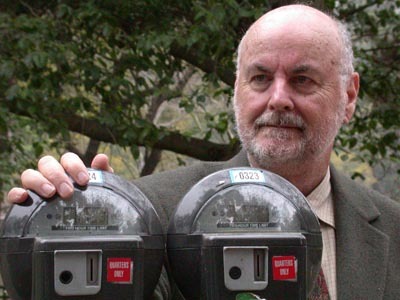 Donald Shoup, professor of Urban Planning at UCLA will be delivering the keynote address on parking in Tacoma on July 27th at the Hotel Murano from 8:45 a.m. to 9:45 a.m.
Shoup is head and shoulders the foremost authority on parking methodologies in the United States based on his education, publication of peer reviewed publications, academic positions, and consulting work. Dr. Shoup will explain how adopting three key parking policies will help create great streets, improve the transportation system, restore the environment, and stimulate the economy. 2) Strip malls where one after another single story building sits on multi-acre surface level parking lots requiring a car to travel between even between adjacent buildings. 1) Parking should be built based on market demand. Off-street parking requirements adopted in most cities in the 1950s and 1960s should be removed. 3) Funds from curb parking revenue should be used for street beautification. It is not that complicated. Let's hope the Tacoma Planning Commission and Tacoma City Council can either attend the conference or they can somehow persuade Shoup to appear before them to clarify these fundamental issues. Does anyone plan to attend the conference? If one is motivated, they could buy Shoup's 752 page book The High Cost of free Parking. However, there are literally dozens of articles he has available on his website to download for free which cover the same issues. by fredo on 7/8/2009 @ 12:30am "Will our elected officials listen?" by Erik on 7/8/2009 @ 12:40am Perhaps the American Institute of Architects could conduct a quiz of candidates running for office this year and require that no one could proceed in the election unless the candidate scored at least 85 percent on the exam. Based on Shoup's research and book and some other articles, here is my Op Ed published in the Tribune a few years ago on the off-street parking requirement and how it has been detrimental to Tacoma. by morgan on 7/8/2009 @ 9:23am I'm sure they're listening. A couple of them may even "get it." The real question: is will they have the spine to do what really needs to be done. Doubtful. Baby steps, Tacoma. Baby steps. by fredo on 7/8/2009 @ 10:00am The move to a market rate parking scenario seems like a no-brainer. However, there are constituencies which might object to the relaxation of parking requirements. For example, perhaps a developer has just put in a large and expensive parking facility per current code to service a new retail development. The cost of this parking will be amortized into the lease price of the retail space. He's not going to be able to compete with the lease prices offered by other new developments which don't have the parking requirement. by Dave_L on 7/8/2009 @ 10:01am You guys are much more knowledgeable than I on the subject, but just yesterday I was chatting to a developer who, in his time has built several projects in the region. He said he gave up on developing in Tacoma years ago due to the regulations such as parking and found it much easier dealing with surrounding cities like Puyallup, Sumner, etc. It is hoped the tide will finally turn. by DSTacoma on 7/8/2009 @ 10:35am Just one point to quibble over: "the price should be zero if 15 percent vacancy or more is already present, which is the case in the vast majority of the urban areas in Tacoma"
But the price in the vast majority of the urban areas is currently set by unrealistic time limits. 15-30 minute zones throughout blocks of our core does not allow most people to even use the parking for lunch, a meeting, shopping, etc. These are effectively loading zones. Before including them in any measurement of the 15%, these areas need to be either converted to an acceptable time zone (90min or 2hr - effectively lowering the price or barrier to use) or have the standard removed entirely. To see what happens when it goes to no time limits, just look at those sections of Broadway north of 9th. by Erik on 7/8/2009 @ 11:02am He said he gave up on developing in Tacoma years ago due to the regulations such as parking and found it much easier dealing with surrounding cities like Puyallup, Sumner, etc. It is hoped the tide will finally turn. Yes, it has been the worst of both worlds in Pierce County. The county has allowed and subsidized suburban expansion and the City of Tacoma has made it much more difficult to built anything in the city which has forced disbursed the growth outside the city in a sprawlish mess. A renowned expert on city parking issues is coming to Tacoma later this month. Read more about UCLA planning Professor Donald Shoup and his July 27 appearance on Feed Tacoma. BTW, it is nice to see so much activity in the Tacoma blogosphere today! "I hope so. This has an on going problem for 40 years"
As the former mayor, you bring a unique perspective to the issue. Let's hope Tacoma can move past trying to to force downtown Tacoma and its urban centers into being auto centric unwalkable suburban strip malls. by ixia on 7/8/2009 @ 3:15pm What's the fear? Only if we don't change anything, nothing will change. For many years I lived in urban areas in Europe. You don�t need a car because everything you need is right there. Downtown areas are completely blocked to vehicle traffic (except few hours early morning for delivery to stores). Restaurants and cafes take over the streets and sidewalks and merchants have their ware out as well. Farmers markets are daily, permanent and outdoors, even in cold winters. One day a week is evening sale when all the stores are open till 10 pm. Food vendors set up, musicians appear. People come from outlaying areas to hang out, shop, visit and just feel urban for a bit. If we plan for parking, we will have parking. If we plan for people, we will have people. If we plan for next year, next year we will have to plan again. If we plan for the next 100 years, perhaps we can move into a livable future with our downtown. It is doubtful that anyone has even visited Tacoma with one quarter of Shoup's parking expertise. Here is Tacoma's opportunity to come up to speed on the issue. by seejane on 7/14/2009 @ 11:17am When I go to Seattle or Portland I expect to pay for parking AND to have to walk a few blocks. To me it's a sign of a successful urban area. I don't think it's the elected officials that are the major problem with the city... has anyone ever tried to reason with Kurtis Kingsolver the engineering division manager. by Nick on 7/14/2009 @ 1:21pm Ah, but aren't most non-elected city positions managed by elected officials? Certainly not directly, but move up the chain of command and there should be an elected official somewhere at the top. If city employees aren't getting the results citizens want, it's our elected officials' jobs to put someone in that position who can. I'm not familiar with Kurtis, so I won't pass judgment on him. But as a general rule, it's our elected official's responsibility to ensure that, through them, our collective will is properly executed. Great hearing. Tacoma�s leadership has made great strides in understanding urban design over the last three years thanks to a great amount of work by local Tacomans including local members of the AIA. Most specifically, the council is finally understanding how suburban parking requirements force urban areas to resemble suburban strip malls and why parking needs to be based on market demand as other cities have recognized. The revisions to the mixed use center and the amendments offered by the council members will allow Tacoma to finally take a step toward rebuilding a walkable city rather than forcing everything to resemble strip malls or having our urban areas simply remain dead year after year. David Boe and many others at the hearing spoke out in favor of one amendment or another. The council members proposed amendments are beneficial so long as they are not modified or gutted in the end. Please encourage your City Council members to support the current proposed amendments and the mixed use center changes generally and perhaps Tacoma can have brighter future. Reference : AIA recommendations on mixed use center. The City of Tacoma and the Tacoma-Pierce County Chamber invite you to a free public conversation with renowned parking expert and UCLA professor Dr. Donald Shoup. Dr. Shoup has done extensive research on parking as a key link between transportation and land use, with important consequences for cities, the economy, and the environment. With this expertise, Shoup will address parking and mobility specifically in downtown Tacoma. Dr. Shoup will also be giving the keynote address at the PIPTA (Pacific Intermountain Parking & Transportation Association) annual conference and trade show being held in Tacoma July 26-28. This public conversation will be held Wednesday, July 29 from 8-9 am at the UWT Carwein Auditorium. Whenever the conversation about parking in Tacoma comes up, one of the names often dropped into the discussion is that of Professor Donald Shoup. As Erik Bjornson pointed out a few weeks ago, Dr. Shoup is coming to town to speak at a conference. Now, the City of Tacoma and the Chamber invite you to a public conversation with the professor. by morgan on 7/24/2009 @ 6:11am FREE!!!!! Tonight is the second and final reading of the Mixed Use Center revisions as well as the numerous amendments being proposed by council members. * single family homes are protected with this amendment by a) concentrating growth in our MUCs so that it doesn't bleed in to our single family neighborhoods and b) the wedding cake approach of "stepping bacK" applies so that homes across the street from MUCs would not have the effect of looking at a "big" building. * Without this amendment, we will continue to restrict private capital investment and make fully maximizing these MUCs difficult. Several project being contemplated are hamstrung without this amendment. * You need only one "protection" for nearby single family homes - the wedding cake, step-back approach OR the yellow lines in the maps of the NCX zones - NOT BOTH. We suggest the wedding cake, step-back solves the problem and we should not restrict growth in the NCX zones and limit livable, walkable, compact neighborhood centers. I have heard that it will be a close vote tonight. I have sent an email to the council members supporting the revisions and suggest you do the same and to appear to at least sit in the audience to support the passage of the amendments. Tonight is a critical night as the 17 mixed use centers are on the line.